The ad, placed by the American Beverage Institute, hit the Nevada newspaper Wednesday. The full-page advertisement ends by warning Nevadans that it’s time to “rethink their vacation plans.” View the full-page ad in the Las Vegas Review-Journal here. The group has been running similar ads in newspapers in Utah, Colorado and Idaho. State legislators approved lowering the arrest level from .08 BAC to .05 BAC and Gov. Gary Herbert signed the bill into law earlier this year. The new threshold in Utah takes effect Dec. 30, 2018, making Utah the first state in the nation to adopt a .05 BAC limit and the strictest DUI limit in the U.S. The American Beverage Institute has also launched an online petition opposing the .05 percent blood alcohol content law and is strongly urging Gov. Herbert and the Utah legislature to repeal the law during the upcoming special legislative session in June. The petition had garnered more than 1,300 signatures within 24 hours. “It would be one thing if lowering the arrest level to .05 would actually save lives,” Longwell said, adding that all the law does is distract law enforcement officials from targeting dangerous offenders with a .15 BAC and above who cause 77 percent of alcohol-related traffic fatalities in Utah. Competition among the states for the public’s discretionary money. Let’s remember that there is a huge profit motive behind these ads, in that most eating establishments rely heavily on the wildly profitable alcoholic beverages for their existence. Utah is recognized globally for: its outdoor adventure activities, exceptional scenery, and of course as the HQ of the LDS church. Just about any tourist from outside of the US has to deal with 0.05% BAC regulations at home. Whether skiing powder in LCC, or hiking around Zion National Park, these folks will continue to enjoy what we have to offer. While Las Vegas has lost some momentum as an American gaming epicenter, thanks to numerous Native American casinos, they still have a leadership role in the market for adult entertainment…….. Personally, if someone is offended by Utah’s proposed changes to the legal definition of impairment, then I am glad they did not visit. If weed is your intoxicant of choice, then Colorado has a great infrastructure for distribution, and Nevada is getting set up. Here in Whitetopia, many of us are perfectly happy with the upcoming legislation. Now, if they can figure out how to enforce the distracted driving regulations for text messengers, that would be “huge”…. Yeah, we all know who is happy about the ridiculous laws passed here in the People’s Republic of Utah. Perhaps self driving vehicles will solve the problem of drivers impaired by a host of circumstances. 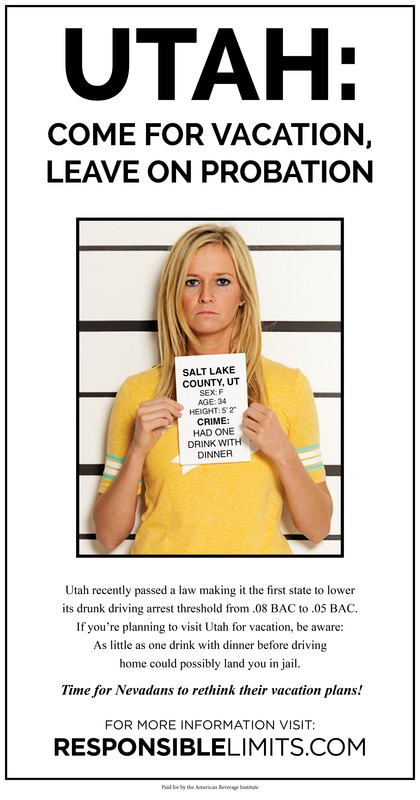 In the meantime, vacationers and Utahans can “enjoy a drink with dinner without the threat of jail ” since as the article states “having little MORE than a single drink” may get you over the limit. For those wishing more than that single drink there are cabs, designated drivers, walking, drinking at home, etc if you really must get your BAC over that .05 limit. I don’t get. Much of Joseph Smith’s revelations were fueled by alcohol, but state of Utah wants to continue criminalizing it. If I were these Utah lawmakers, I’d say it’s time to go back to your roots!! Maybe visions and the speaking of animated tongues will reimmerge, just like in the inception days of the church!! We hear a lot about “fake news” these days. Thanks @greatsuc for the “fake history”. Props, though, for trying to write off the facts with the Trumpism “fake history,” when the facts don’t match your own belief or agenda. @greatsuc, and spouting off your own opinion doesn’t make something factual either. Your own historical research falls short when trying to make your claim. Common alcohol practices in the early and mid 1800’s hardly serve as evidence of “alcohol-fueled revelations”. Try again. Might notta been alcohol, but it certainly was something. I dunno what kinda drugs they back in them days? hallucinogens? Maybe some of that skunkweed growing wild along the ditch banks. Maybe young Joe Smith smoked it? Well there was definetly something fueling those “revelations”. Joe and Brigham were probably trying to drink one of their many wives pretty and it got in the way of their divine revelations. “Only 1 percent of traffic fatalities involve drivers with BACs between .05 and .08 because at those levels, impairment is not meaningful.” 1% of 40,000 traffic fatalities (2016) is 400 fatalities. I’m pretty sure the families of those 400 people don’t view that impairment as “not meaningful”. Let’s hope that 1 percent isn’t your spouse or child? Would that be 1% of traffic fatalities involving drunk driving or 1% of total nationwide traffic fatalities. Because if it is the latter that is a very significant number–1000s of lives per year. As someone who rarely if ever consumes alcohol anymore I can tell you: if your system isn’t used to it (bc ur non-drinker or haven’t drunk in a long while, etc, etc) all it takes is one drink to be impaired enough that you should not drive, period, regardless of BAC. And if you’re pulled over for erratic driving, and a cop suspects you’ve been drinking to the point of impairment and requires a breathalyzer, let’s be real, you were probably too impaired to be driving. so, I say go with the .05 if it saves life and encourages responsible drinking. oop, mighta got the maths wrong in there, lol. Deaths of 1% might be something like 402 for 2016.